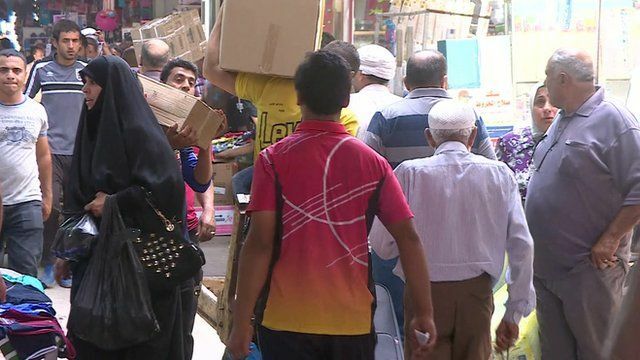 'Life has to go on' in Baghdad Jump to media player Despite the threat of the so-called Islamic State militants, life in the Iraqi Capital Baghdad seems normal. Face-to-face with IS militants Jump to media player The BBC's Orla Guerin is given exclusive access to members of an alleged Islamic State militant cell. Ramadi refugees stranded on bridge Jump to media player Omar Abdel Razek is at a river crossing where thousands of residents from Ramadi are hoping to cross into the Iraqi capital Baghdad. Militias stage fightback against IS in Iraq Jump to media player Pro-government fighters in Iraq have begun to fight back against IS militants in a bid to recapture the town of Ramadi. US strategy in Iraq makes 'perfect sense' Jump to media player The US Defence Secretary Ashton Carter has said American strategy in Iraq still makes 'perfect sense', despite the recent loss of the city of Ramadi, to Islamic State. Ramadi's displaced in 'no man's land' Jump to media player Thousands of people who have fled Ramadi since the city fell to IS militants, have been left stranded between Ramadi and the Iraqi capital Baghdad. Iraqi PM: Ramadi recapture 'in days' Jump to media player Iraq's Prime Minister Haider al-Abadi said Mr Carter's comments were misinformed and that Iraqi forces were just days away from recapturing Ramadi. Despite the threat of the so-called Islamic State militants, life in the Iraqi capital Baghdad seems normal. The markets are bustling with people, who are trying to carry on with their daily lives. They say that Iraq is used to this tense security atmosphere, but they are suffering a double tragedy, due to economic hardships. Sally Nabil reports from Baghdad.